Hello! The goal in this entry is to provide some insight on an approach to getting from an idea to a viable concept image. 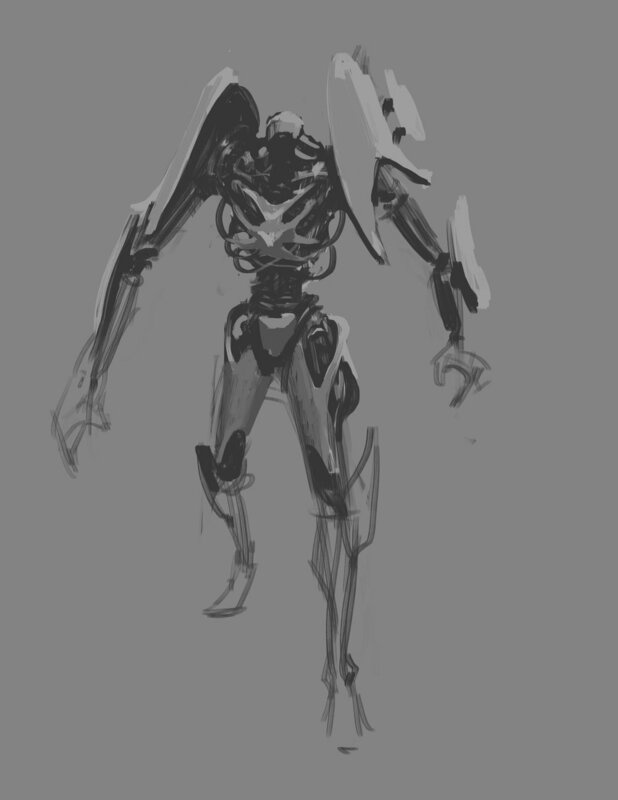 In this case, I wake up in the morning with a somewhat vague idea for a robot that I think might look cool. I think about it more throughout the morning as I go about my routine, and finally, I just have to put it down on paper(so to speak...). If you're anything like me, inspiration like this doesn't happen every time you sit down to work, so getting started right away is a must. Let's go! What I want to create is a humanoid robot with a very noisy, but rounded chest surrounded by big long shapes for the arms and legs. I'm thinking the contrasting parts would play well against each other. What I put down for my initial rough is basically that. For many people starting out, this can be a tricky phase because they might want to start making everything look amazing right away, before the idea is even fully thought out. Keeping things loose, dirty, sloppy early on might make it seem like you'd end up with an ugly image, but what's important here is to focus on design/layout in a graphical sense. By that I mean, we are paying attention to how we place areas of contrast, big shapes vs little shapes, and general proportions. Once I have something I like, I move on to defining some of the main shapes and forming an aesthetic. For the chest I add some ribs that run through to form a sort of lattice, then thicken the center to make it feel a bit more protective. At the same time, I'm trying different shapes for shoulder armor and along the arms that would play well against the torso. I like the curved shapes in the chest and use that as a basis for the aesthetic, bringing some of that design into the legs and arms. At this point I'm pretty happy with the overall design and move on to applying some basic color. I'm using an overlay here and it might be worth mentioning that the grays currently in the image are kept fairly close to 50% where possible to make the overlay process more predictable. I try a few colors and go back and forth for a bit (overlay makes this easy) until I find something I like. I chose yellow because I wanted something vibrant that contrasts strongly with the dark colored machinery. With the main color in place, I add some white for an accent color and begin to darken some of the machine parts to push the contrast. From here on out the design doesn't change a whole lot. Most of what I'm doing from here is cleaning up blurry edges, adding panel lines, and defining some of the inner workings. Finally, I add some extra lighting and texture information using a combination of overlays and textured brushes to improve the overall presentation. For the purpose of this exercise, I'm content with this level of finish. As you can see, there is still a lot that is undefined and messy, but what's important here is getting the idea presented. In a production setting, concepts with this level of finish are used to explore ideas to help form a style before going into production. More fully rendered concepts might be needed at different stages of development, but I'll leave that for another entry. That's basically it! If you have any questions or comments please let me know. Thanks for reading!